When it comes to Twitter Applications (Twitter, Facebook, WordPress) there are unlimited applications and being a regular Twitter user I will never ask you to stick to one single twitter client. 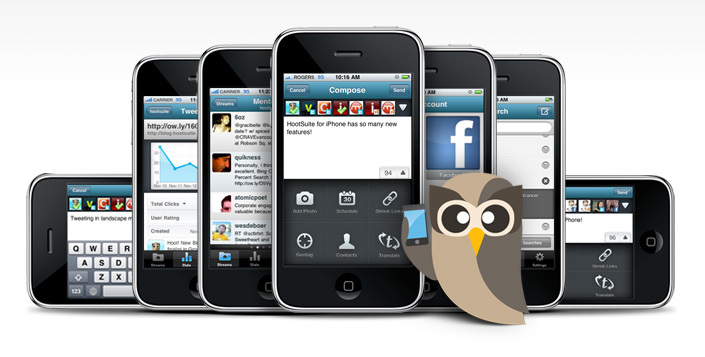 Hootsuite will let you manage multiple Twitter and Facebook profiles. It has tabbed system which can be used to quickly switch between multiple profile with one click. You can monitor @replies @Dm with one click. You can also reply from specific mentioned twitter profile and the best part is nothing is confusing. It will let you add other accounts like WordPress, Myspace, LinkedIn, PingFM, and Foursquare. Autotweeting is one of the best feature of Hootsuite. It will automatically tweet your blog post with latest updated post via your feeds. All you need to do is add your feed address and select the profile from which you want to autotweet. Tweet and Status Updates scheduling is very important feature which every one should use. Tweeting post helps in driving lots of traffic. You can schedule event reminders, links, and blog post on a schedule without needing to be available. This is a nice feature for spreading out postings over the entire day, instead of posting everything at once. Hootsuite also let you tweet or update the same link from multiple Twitter and Facebook profiles at one go. This is very helpful in case if you planning to make a link viral. Provided people follow your tweeted links on all the profile. There are some more features (http://hootsuite.com/about) which you will love about Hootsuite, and I will suggest go and try this twitter application to make most out of it. Great job! I LOVE me some HootSuite! I just scheduled all of my tweets to remind members of the professional Association that I belong to (TSAE) to RSVP for my presentation on Google Analytics on August 25th! What a time saver! We’ll definitely be using this more often for FACC Events and Convention!